i was afraid that this would happen. Qantas have cancelled flights (including mine) in Canberra this afternoon. My backup plan of a bus or train leaving Melbourne around 7:20am wasn’t able to be enacted as my flight was not cancelled until after that time, so I have had to enact my other backup plan of hiring a car. The joys of needing to be back at work at 5:30am tomorrow. I chatted with Luke Grant on MTR 1377 this morning after 7:30 and he suggested that, seeing as I travelled to Melbourne to see Andrew Bolt, Andrew should drive me back to Canberra. I don’t think Andrew agreed because I didn’t get a call from him after his spot on MTR. Oh well, as chaotic as this trip is, it was well worth it. Many thanks to the Institute of Public Affairs for putting on last night’s evening. 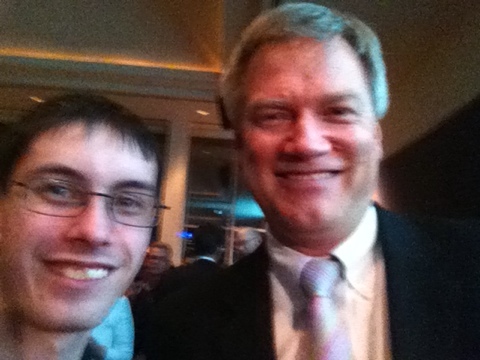 Before I go and work out where this car rental place’s CBD office is, here’s a photo of me with Andrew Bolt. I suspect that I should have used the flash. I suspect Andrew would be a little taken aback by this comment, but before I put my specs on, I thought you were standing with Geoffrey Robertson! No I don’t think you needed a flash setting.